On this page you can see two screenshots of the WordCreator. The screenshots are available for the operating systems Windows 10, Windows 7 and Linux Ubuntu. You can switch the shown operating system with the links under the screenshots. After you have started the application, first you will see the WordCreator on the tab "Creator". With this part of the program, you are able to create random words. To create words, just click on the button "Create". 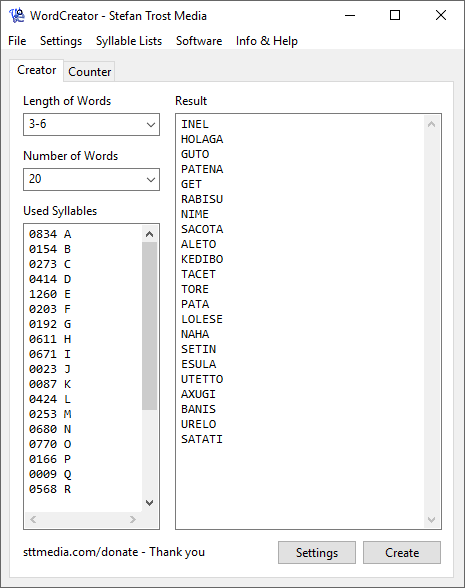 In the upper left, you can define the number and length of the created words (in the screenshot 20 words with a minimum length of 3 and a maximum length of 6 elements), the used syllables can be defined in the box down left (see syllable list for more information about the structure and creation of custom lists). You can find more settings with clicking on "Settings". Screenshots and explanations of this can be found here. On the second tab, you can find the counter. Using the counter, it is possible to create frequency profiles about the letters, syllables, words or character combinations of arbitrary texts. First of all, copy the text, you would like to count, in the left box. After that, click on the button "Count" to show the result of the counting in the right box. Under "Settings", you can determine what should be counted (specific characters, exclusion criteria, characters, syllables, words etc) and how the results should be displayed. Screenshots and more explanations of the settings can be found here. If you right click the result, you can export the table for example as CSV, HTML, XLSX, ODS, DIF or as text file. Further screenshots of the WordCreator can be found on the pages Counter and First Steps. 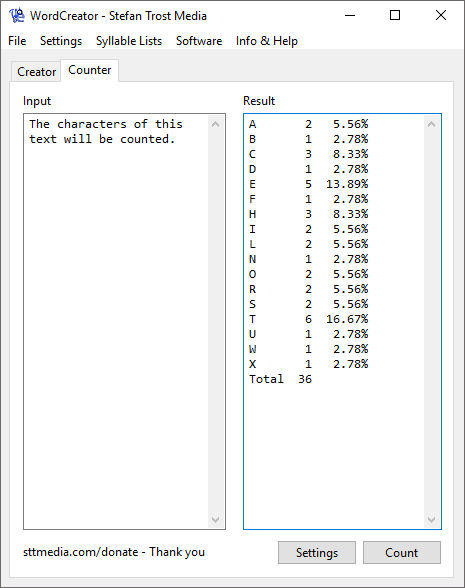 Screenshots of the old version of the WordCreator can be found here as well as on the pages Syllable Counter for Di- and Trigraphs, Unicode Counter, Help: TextCreator, Character Counter and Syllable Counter for real Syllables.